Militants carried out 49 attacks on 15 February. 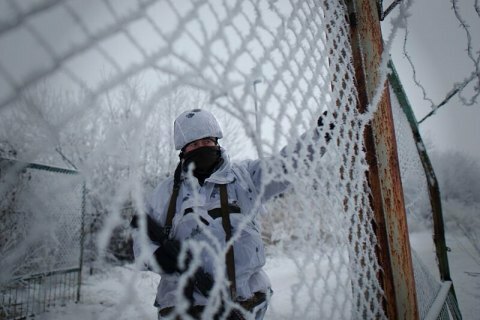 On Wednesday, 15 February, Russia-backed militants of the self-proclaimed Donetsk and Luhansk republics carried out 49 attacks on the positions of the Ukrainian military in Donbas, killing one soldier and wounding three. One serviceman was injured. The press centre of the antiterrorist operation (ATO) HQ said in its morning update on 16 February that in the Mariupol sector, the village of Vodyane was shelled with mortars and infantry fighting vehicles (IFV) weaponry. The enemy used IFVs, heavy machine guns and small arms against Shyrokyne, Hnutove, Vodyane and Pavlopil. Novotroyitske was under sniper fire. In the Donetsk sector, militants shelled the positions of the Ukrainian army in the areas of Avdiyivka, Opytne and Novoselivka Druha, and fired rocket-propelled grenades at Zaytseve and Pisky. In the Luhansk sector, Krymske, Novooleksandrivka and Novozvanivka were targeted with mortars and grenade launchers. An enemy sniper was active in the vicinity of Lobacheve. On Tuesday, the ATO headquarters reported 52 enemy attacks, no casualties.